with Rick and Ronnie Smith DVD. $39.95. Today we're looking at the Huntsmith DVD collection. This is the Rick and Ronnie Smith Silent Command method. It's one of my favorites. I started training birddogs as a 10, 11 year old based on the Delmar Smith method. Delmar Smith is Rick's dad, Ronnie's uncle. This is the continuation of the method that Delmar developed in his "Best way to Train your Gundog" book that was a classic for years. It is the Silent Command method mainly because they are not big fans of using all sorts of commands with your dog until the dog understands what's going on. It's a complete system. They use what's called Point of Contact. Rick and Ronnie use e-collars exclusively in their method, so if you are not looking for an e-collar system this is definitely not the way to go. The use low level continuous stimulation and they teach what's called Point of Contacts where they teach the dog that stimulation on different parts of his body means different things. They teach a dog how to walk at heel, how to come to you when called, how to stop. Their whoa post technique is my favorite way to teach a dog how to stop. It's hands down the most effective method that I've seen as far as low stress on the dog. Incredibly effective. When you do it with an e-collar you can actually stop a dog in the field for any reason whatsoever just really fast. Works great. I was amazed the first time I saw Rick do it with a dog. The first time I saw it was on one of my dogs and couldn't believe how fast he took a dog from having no idea how to stop to being able to stop with just the slight press of a button with a really low level stim. It's a great technique. They have two puppy videos. The first one starts off with a very young puppy, teaches you care, basic table work, and real intro as far as just puppies. The second video covers field work with your puppies, getting them out in the field, introduction to guns, introduction to birds. And then you've got the silent command method. You've got the first book which covers whoa post work using the Wonder Lead, working off of the chain gang. And then the intermediate video covers taking the commands learned on the rope and on the check cord and transitioning those over to using the e-collar. It's a complete method. The majority of my dogs are trained with this method. It's one of my favorites. If you are looking for a great way to train your dog using a remote training collar, this is the way to go. It's designed for pointing dogs but it has applications for retrievers also. The Huntsmith DVD set. This is a great DVD for pre training your pup. I especially liked the chain part. It helped my pups adapt to the lead. I haven't put it to practice as of yet (dog doesn't come until spring 2016). But the techniques are sound. This was actually a replacement for one I loaned out that failed to return. That says it all. "A lot of good training information." A lot of good training information. Learn and watch young puppies develop their very first behavioral patterns. Watch Rick and Ronnie Smith demonstrate how to start your puppy right. This is not a puppy training video, but rather a video to teach you how to develop your puppy's behavioral patterns. Conquering behavior at a young age means a better behaved dog later. Working through the steps in this video will prepare your dog to listen to orders so that you can train him successfully. Puppy Development reviews six opportunities to gain your dog's willing acceptance of restrictions which is necessary in training. This willing acceptance behavior will be demonstrated in six sections. This video is the first step to developing a dog that is a pleasure to be around. 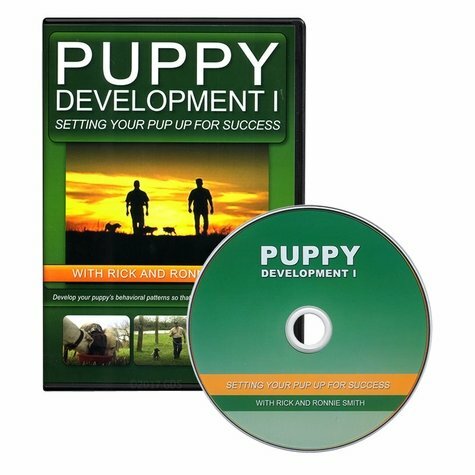 Continue your training with Puppy Development II, and The Silent Command System Volume 1 and Volume 2. The Smith family has provided bird dog training for almost a century and training seminars since 1968. Rick and Ronnie Smith are products of this training tradition and bring to you a lifetime of knowledge and experience. Both Rick and Ronnie operate training kennels and guide quail hunts. They have a legacy of training numerous National and International Champions, producing training videos and teaching seminars all over the world.